Following on from the successful deployment of Health TV, Supermarket TV was initially installed in the New Zealand’s largest supermarket, PakNSave Lincoln North. Supermarket TV is deployed utilizing the same Kordia network technology as Health TV. 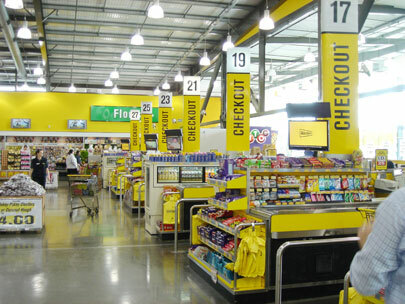 In each Supermarket a wireless network connects individual checkout and aisle Dynamic Digital Signage displays with the Supermarket TV Head Office. Each display includes directional speakers to attract shoppers to view the Dynamic Digital Signage screens. All content is zoned to be relevant to the Dynamic Digital Signage screen location and checkout Dynamic Digital Signage displays include promotional media for items that can be purchased at the checkout.